Carola is hooked on her self-designed "Coughing Fish" fingerless gloves -- she crochets little "bridges" between the fingers -- and has kindly published her pattern. Can you resist a one-skein project? Gale (scroll down) knit another pair of fingerless gloves -- this pair reminds me of zebras. Jen finished a pair of i-cord gloves and offers an excellent tip for closing the i-cord gap in the fingers. If one stitch does not completely close the gap, walk 2 new stitches up instead. Jen J. 's i-cord gloves are finished "for the first time" -- she plans to re-knit one of the gloves to correct a gusset faux-pas. Jillian completed a third pair of gloves -- The Firm Fitting Gloves by Mac & Me. Julia finished an amazing pair of Floral Fair Isle Gloves -- truly a work of art! Kimberly finished a fabulous pair of Norweign mittens. She loves them so much she may just sleep in them! Kira's fingerless gloves are bright and happy with her "mismatched" colors. Kristin highlighted a beautiful hand spun yarn in her fingerless gloves. 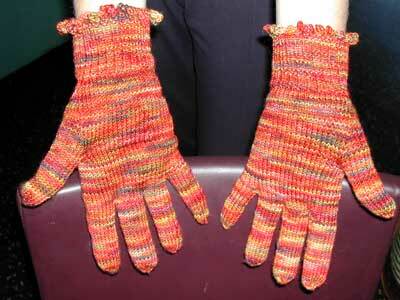 Lynn H. finished her pair of i-cord gloves, weaving the ends in as the clock struck midnight. Check out her good looking gusset! Sharon found the knit along's deadline was an excellent motivator to get her to finish her tipless gloves. As for the final numbers --- 116 knitters signed up to participate, 74 knitters finished at least one pair, and 103 pairs of peaceful palm coverings were completed. For those knit alongers not yet done, please feel free to email me when -- and if -- you finish and I'll update your name in the list. Glenda finished a wonderful pair of cabled fingerless gloves just in time to meet a friend for a pint. Irisine is not an official member of the knit along, but knit this beautiful pair of i-cord gloves I had to share. Kathy finished her third pair of gloves, the color work and color combination of this pair is truly stunning! Kelly completed her second pair of Peaceful Palms, a colorful pair of fingerless gloves. Kim (scroll down to January 15th) finished her second pair of gloves, a pair of i-cord gloves knit with self striping yarn. 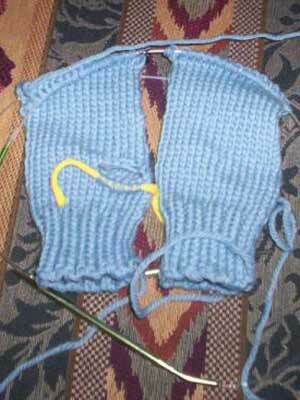 Mary's first FO of 2006 was a pair of gloves -- her first pair of gloves -- knit out of Koigu. She used the Interweave "Progressive Glove" article to work out her pattern. Sara designed and knit a pair of tipless gloves as a Christmas gift for her step-mom. Anna has recovered from the busy holiday season at her soap shop and is poised -- yarn and all -- to begin her pair of peaceful mittens. Jen J. is "glovin' it" with 5 fingers down and 5 to go. Kiri is starting a pair of mismatched gloves using yarn from her stash -- if they're mismatched there are no worries of running out of yarn. 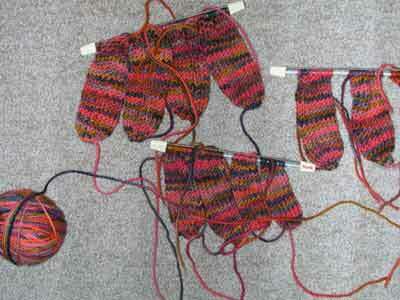 Mimi has nothing finished yet, but has three different pairs of gloves in the works, which will she finish first? Wanda is knitting a pair of i-cord gloves and is currently addicted to finger knitting -- we call it "finger fever". Next week, on the 31st, will be the last "official" day of the knit along. But don't worry if you're not finished by then -- just email me when, and if, you finish and I'll turn you blue in the knit along list. Amanda's Warm Wristlets were her finished FO of 2006. Amy finished 3 pairs of mittens -- The big blue ones are for a friend, the cream and brown a request from a friend for an "early birthday present" (her birthday is in october), and the itty bitty ones are for Amy. Ann knit a beautiful pair of cabled mittens, unfortunately they are too big :-( She has plans to knit another pair. Cathy Z. completed a stunning pair of Sonata Gloves and has started on some i-cord fingers. Faith finished a good looking pair of Urban Necessity gloves for her brother-in-law. Gale was inspired by her neighborhood colors to knit these simple but beautiful fingerless gloves. Kristin finished a pair of the Lace Up Fingerless Mitts from Alterknits. Laura completed a great pair of guy's gloves -- her first pair of knit gloves! Lu finished her 3rd pair of Peaceful Palms, this one a pair of fingerless gloves for herself. Sherry finished her Paradox mittens -- be sure to check them out, they are truly amazing. Sherry has a goal of knitting a pair of gloves or mittens for every day in the week. She has 3 down and 4 to go! Winnie completed a pair of fingerless gloves for her husband using Ann Budd's Handy Book of Patterns. Followed quickly by a pair of mittens for her daughter -- thumbs up! Glenda has half a pair fingerless glove -- I love the cable going up the middle. Are your palms peaceful yet? It's never too late! Agnes finished her second pair of gloves -- this one a pair of Broad Street Gloves for her brother. Amanda finished a second pair of mittens. These "Mike the Tiger" mittens are for her son. Amy P. persevered through a wrist injury to finish her Cigar Gloves. Carina's palms are looking very peaceful in her alpaca fingerless gloves. Cheryl finished not one, but two pairs of fingerless gloves -- both knit with her own hand-spun yarn. She is also in the midst of knitting a pair of i-cord gloves, if she could just find her misplaced thumbs! Erin knit a fun pair of wrist warmers for her daughter -- along with a matching hat! Janine finished two more pairs of gloves -- one for dancing daughter and the other for skateboarding son -- lucky kids! Julia (scroll down) finished a pair of arm warmers knit in a spiral rib pattern -- check them out the colors are beautiful! Katie finished two pairs of manly wrist warmers -- one for her dad and the other for her son -- along with a feminine pair of wristwarmers for herself. Kim finished her second pair of gloves, which will be a gift. She struggled with 2nd glove syndrome, but was able to pull through! Lu finished a fun, bright pair of red mittens along with a matching hat. She is also working on a pair of lacey wrist warmers. Sparky completed not one, but two pairs of wonderful gauntlets. Springy finished her first pair of gloves and learned to knit on 2 circular needles in the process. Tara finished her 3rd pair of Peaceful Palms -- a pair of fingerless mitts knit with her own Kool-Aid dyed yarn. Ann is knitting her first pair of mittens. She's enjoying the cable pattern and is finding the mittens to be a quick knit. Elaine finished her first mitten. She's using Yarn Forward's Thrummed Mitten pattern. Laura finished one of her gloves. She's knitting the cigar gloves. Great job all you Peaceful Palmers! 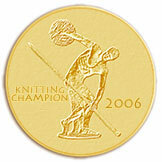 We have lots of finishers, many knitting multiple pairs. Have no fear if you haven't started yours yet, the knit along runs through the end of January -- plenty of time! Alice has woven her ends in on her tipless gloves and is now officially blue. Amanda finished a cute pair of mittens for her daughter. The mittens are so loved, her daughter's preschool teachers had a tough time coaxing them off and into the cubby. Amanda also has plans to knit another pair. Beverly enjoyed knitting her Progressive Gloves and has plans to knit more. 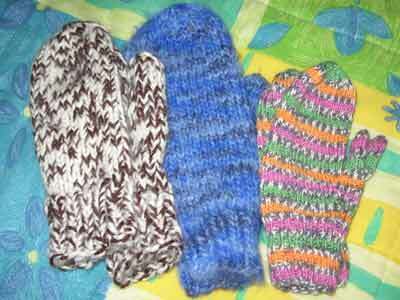 Jillian finished a 2nd pair of gloves -- these are the Men's Handwarmers from Last-Minute Knitted Gifts. She also has plans to make a couple more pairs to give as holiday gifts. Susie has finished several pairs of gloves and mittens and has several more in the works. Tara is keeping a 2nd pair of Peaceful Palms warm with her "Hurry Up Spring Armwarmers". Teri finished a beautiful pair of mittens based on Elizabeth Zimmerman's mitered mittens pattern. Christina has finished her first mitten. She's using Jo Sharp's wool and has cleverly adapted the Coronet brim for the cuff of her mitten. Elaine is having fun adapting her Opera Glove pattern to use a thinner yarn and more decorative decreases. Glenda almost finished one of her modified opera gloves before she decided it was destined for the frog pile. She has a great idea for her gloves -- I hope her second attempt is more successful! Lynn P. is working on her second pair of peaceful palms, mittens this time. Laura has worked out all the math and pattern modification for her boyfriend's gloves and is making great knitting progress. Lisette has all 10 fingers done and is ready to join them together. Queen of the Snow Cows has written a nice little tale to report her glove progress. Read about it here. Regina is knitting a pair of i-cord gloves and is almost finished with her fingers. Ronda plans to knit a pair of Urban Necessity gloves for her daughter. Do you have any Peaceful Palms news to report? Agnes finished a fabulous pair of lace gloves from A Gathering of Lace. Agnes recommends that if you like knitting socks you'll also enjoy knitting gloves -- I totally agree! Bernadette is definitely hooked on gloves finishing her second pair of Hooray for Me Gloves -- this pair for her son. Betty finished a great pair of tipless gloves for her son. She enjoyed the entire glove knitting process -- up to the weaving of ends, that is! Carola finished her pair of "Glottons" using Noro Kureyon. She cleverly added crocheted "little bridges" between the fingers of these fingerless gloves -- be sure to go look for yourself! Ceris knit a beautiful pair of gloves from Louisa Harding's Gathering Roses Accessories Collection. Dena is very happy with her i-cord gloves -- loving the yarn and the finished gloves. Ina is well into her Holiday Knitting completing a pair of fingerless gloves of her own design. These will make a great holiday gift for the lucky recipient! Judy is also a multi glove finisher. She finished her 2nd pair of fingerless gloves -- using a toothpick to knit the thumb -- and is well into her 3rd pair. Kim (scroll down to Nov 17th) finished a pair of gloves for her boyfriend using one strand of alpaca for warmth and one strand of Sock It to Me wool/nylon for strength. Margene finished her Grrlfriend Gloves and found they went great with her newly completed Brier jacket -- check out her complete hand knit ensemble here. Mary finished a pair of fingerless gloves -- she plans to wear them when cycling to work. Mia's beautiful, lacy gloves were finished just in time for the first snow. Renata finished her Broad Street Mittens, modifying the pattern to include an intarsia star on the mitten cover. Tara, a new knit alonger, has already finished one pair of gloves for her father-in-law and plans to make a 2nd pair for her mom. Alice is almost finished with your tipless gloves, having only the ends to weave in. She cleverly used short rows to subtly shape the back of the hand. Carina (scroll down) has finished her first Garn Studio fingerless glove -- it looks very soft and cozy -- and is well into its mate. Elaine plans to knit Sweaterscape's Opera Gloves -- long and elegant. Faith has finished the fingers of her first Urban Necessity glove. Heather O. is knitting a pair of top down gloves. After knitting several i-cord fingers, she switched to using i-cord until the increases were done and knitting the rest in the round. Kelly is converting a pair of partially knit socks into her second pair of Peaceful Palms gloves. Laura is primed and ready -- books and magazines collected, yarn purchased, fingers measured -- to knit a pair of gloves for her boyfriend. Sherry is knitting Lucy Neatby's Paradoxical Mitten -- quite cool. Springy is almost finished with her tipless gloves, only 2 more fingers to go. Go on over and cheer her on to the finish line. Winnie has started a pair of fingerless gloves for her husband. Carry finished her NBaT and it looks great -- worth all the hard work! What fun it's been following everyone's Peaceful Palms progress. To date, the most popular glove patterns seem to be Hooray For Me Gloves and Broad Street Mittens. Several of you have been adventurous and are knitting cabled or lace gloves, while others are designing their own gloves. For many of us, these are our first pair of gloves and we're learning a lot. What Peaceful Palms news do you have? Bekki finished her Broad Street mittens and has artfully hidden them behind a delicious looking pumpkin pie! Gale finished her Laced Up Fingerless Gloves from AlterKnits and confesses that she may have knit them just so she could buy some beautiful ribbon for the laces! Be sure to check out her nature inspired photos. Janina finished her Natalya gauntlets and has enjoyed wearing them. She learned several new things while knitting these gloves including, "how to drop down stitches to fix a mistake rather than ripping back, a very valuable thing to know indeed." Janine knit a beautiful pair of lace gloves from A Gathering of Lace and plans to knit a matching scarf. I admire Janine for tackling lace gloves for her first pair of gloves. 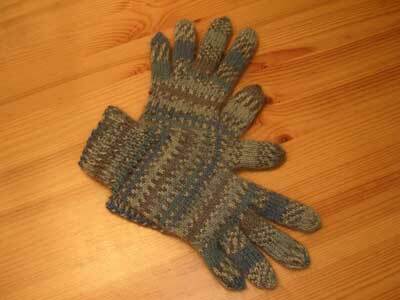 Over the weekend, she also finished a pair of Broad Street Mittens -- aka Riggng Gloves -- for her husband. Joy knit the Eowyn wrist warmers from Rowan 38, which turned out really well! Kristin finished her pair of Mac & Me fingerless gloves. The yarn she used looks so soft and subtle that the gloves are screaming "wear me, wear me"! Melissa F. also finished a pair of Lace Up Fingerless Gloves from Alterknits. This was Melissa's first pair of gloves and they turned out really well! Teresa knit a fun pair of Hooray For Me Gloves in self striping yarn. Agnes has started her Vanalinn Gloves from A Gathering of Lace. She's also recently finished the most amazing sweater! Becky is making the Cigar Gloves for her husband. Since this is her first foray into glove knitting, she's knitting a test glove to get the kinks out -- in our house we call this "the tester pancake". Carola is knitting a tipless variation on the i-cord gloves -- very creative! Dena connected the i-cord fingers of her gloves, only to discover the fingers were too long. She plans to rip back and shorten the fingers. Julia is knitting the most stunning pair of fair isle gloves. She's also put together a photo album with her progress pictures -- check it out. Kathy's palm is looking more peaceful already in her partial Hooray For Me Glove. Kim is experiencing a bit of 2nd glove/sock syndrome, having finished one of each. Lynn F. has caught the finger fever and has been having fun experimenting with the i-cord fingers. Lynn P. finished her first fingerless glove using the Potluck Wool Mittenettes pattern. She knit the glove on 2 circular needles using fishermans wool she dyed with Koolaid. Margene is 2 fingers shy of finishing her Grrlfriend Gloves. Renata finished her first Broad Street mitten. She's updated the pattern by adding a star. You can find her star chart here. A lot of you are discovering that knitting gloves -- both with and without fingers -- can be quite addicting. 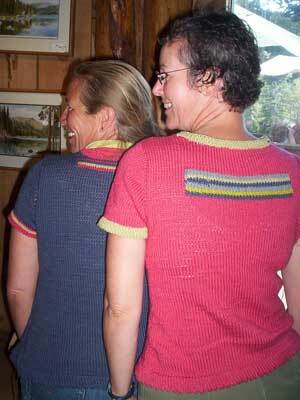 How many of you have knit, or plan to knit, more than one pair? I know I have! Alison finished a beautiful pair of fair isle tipless gloves. 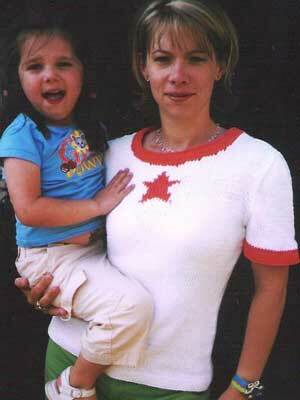 Pop over and find out why Alison made her left hand pinkie intentionally shorter! Bernadette knit the Hooray For Me tipless gloves in a fun self striping yarn. Guylaine completed a wonderful pair of Tyra Wristwarmers. Jessica is sporting a terrific pair of Ruffle Gloves -- a ruffle makes a very nice cuff embellishment. Kelly finished the tipless gloves for her husband and has started her own blog. Kimberly (scroll down) is all done with the cable gloves she designed for herself. She learned that unless you take careful notes, it's hard to exactly replicate the first glove! Reb has finished not one, but two pairs of fingerless gloves to give as gifts to two very different recipients. Vicki's finished Natalya fingerless gloves turned out really well. Agnes has begun a pair of Broad Street Mittens for her brother and is contemplating whether they are too big. Alice knit her first fingerless glove based on "The Knitter's Handy Book of Patterns". She too is contemplating whether they are too big. Am I detecting a trend here? Angela finished her first glove also based on "The Knitter's Handy Book of Patterns" and has already begun thinking of ways to tweak the pattern for her hand. Bekki is also making the Broad Street Mittens, hers in a mystery color. Beverly used the Progressive Gloves article from Interweave Knits (Winter 2003) to create a glove just right for her hand. Ceris has solved her "what should I knit" dilemma and is planning to knit the vintage beaded gloves from Handknit Holidays using Blue Skies Alpaca. Cheryl's got a whole pile of knit fingers! She's started joining them together and adding a bit of color. Gale is knitting the Lace Up Fingerless Mitts from Alterknits. She's had to do a bit of ripping, but has worked out the problem and is back on track. Margene has a glove in progress and is knitting with spectacular yarn -- the yarn is spun with beads and make a lovely cuff for Margene's gloves. Mia (scroll to Nov. 2nd) finished her first lacy, white glove and immediately casted on its pair -- no 2nd glove syndrome for her! Queen has a handful of cleverly labeled fingers! Springy is knitting the tipless gloves from Weekend Knitting and is making good progress -- she's got 2 fingers and one glove to go. Wendy has cast on the fingerless gloves she's knitting for her daughter. She's using Regia sock yarn to knit these. Yuvee designed her own fingerless gloves with a delicate picot edging and has knit the first glove. Any other Peaceful Palm news to report? Beth finished her beautiful, cabled Hermione Mittens and is already planning her next mitten project. Deb finished her i-cord gloves knit from her own hand spun yarn. Jennifer finished her first pair of gloves -- a wonderful pair of fair isle gloves -- and is hoping to knit more! Judy zipped through her fun fingerless gloves. Kim finished a beautiful pair of blue gloves from Weekend Knitting. Michelle finished a nice, long pair of gauntlets that are keeping her warm at work. Rebecca knit her gloves using Regia Sock Yarn and Madil Kid Seta held together. She started with the Hooray for Me glove pattern for inspiration, but made many changes including the number of stitches based on the gauge. 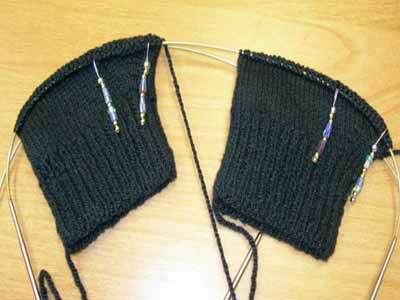 Rebecca added short row shaping so the fingers would fit on her hand, and knit the fingers full length. Sockbug's gloves look nice and cozy -- I wonder if she'll change her name to "Glovebug"? Alice finished her first fingerless glove while watching hockey -- unfortunately she was unhappy with the "baggy palm" and is going to frog and redo. Alison has started her beautiful snowflake fingerless gloves. Amy P. bought the yarn for the two pairs of Cigar Gloves she's making. Angela is making good progress on her first glove and is finding them as addicting as socks! Bekki has declared, "The sock is dead, long live mittens" -- needless to say she's been working hard on her Broad Street mitten/gloves. Carola has uncovered 2 unfinished mittens -- both stuck in the same place -- and has casted on to begin her gloves. Cheryl will be knitting gloves based on Meg Swansen's i-cord gloves. She's had a dream about her gloves and now just has to make them a reality! Dena is knitting i-cord gloves and has her pinky on display -- front and back. Erin is hard at work on her gloves. She was worried about "second glove syndrome", but has quickly moved on to her second glove. Hollis opened a new yarn store today, I doubt she's had any time to think about Peaceful Palms. Jessica was detoured into starting a pair of ruffled gloves. 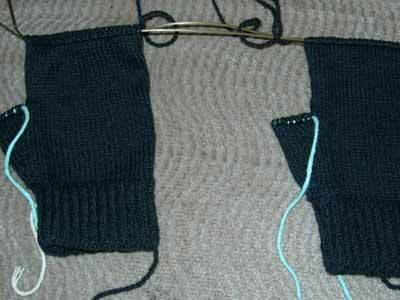 Kim (scroll down) has made great progress with the gloves she's making for her boyfriend. 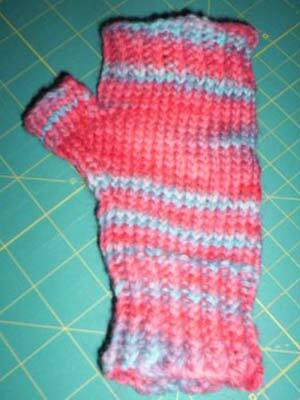 Kimberly couldn't find a glove pattern she liked, so she created her own -- beautiful! Melissa has finished one of her gloves, knit from her own hand spun yarn. Mia is knitting a delicate lace glove -- be sure to click her picture of the glove to get a good look. Mimi has started twice and ripped twice -- both times the glove was too big. Hopefully the third time will be the charm! Springy is almost done with her first fingerless glove. Carla not only finished a pair of "inside out gloves" from Knitters Winter 1992 called Gloves for Rosie, she's also knit 2 pairs of fingerless gloves. Carla is on a roll. Heather finished a wonderful pair of fingerless gloves. I love the shaping of the thumb gussets! Jillian made a beautiful variation of the Lace-Up Fingerless Gloves from the new book, Alterknits. 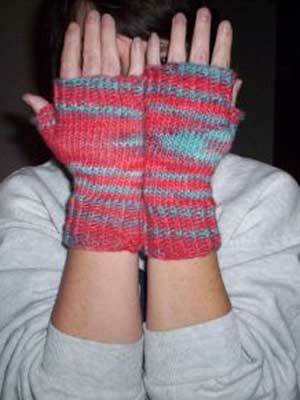 Kathy B. made her teenage son very happy with a pair of hand knit, fingerless gloves. I, nona, finished my first pair of gloves and have plans to make a second pair using the i-cord finger technique. 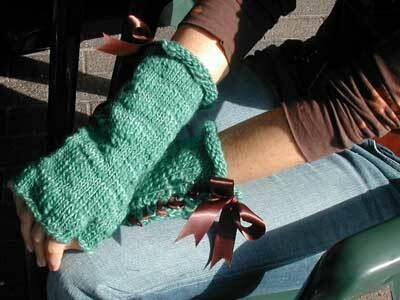 Tracy created a beautiful pair of fingerless gloves knit from her own hand spun yarn. She added a few embroidered details to pull the gloves together. 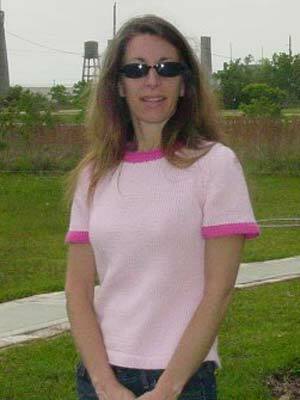 Tracy was the first knit alonger to finish -- she wanted to finish before she headed out for vacation! FYI: Once you've finished your gloves, you'll name will turn from brown to blue in the knit along list. In most cases, clicking the blue name will link you a photo and blog posting on the finished gloves. Bernadette is making Hooray for Me Gloves and is well on her way. Beth -- after struggling a bit with mitten top shaping and cables -- finished her first mitten and has started the 2nd. Check out her beautiful cables! Carina has started these fingerless gloves. Carola (scroll down) has pulled a partial Norwegian mitten out of her UFO pile and is inspired to finish them for the knit along. Deb (scroll down) has almost finished her i-cord fingered gloves knit with her own hand spun yarn -- she just needs to weave in her ends. Dena compiled a listing of glove and mitten patterns she's considering for the knit along. Kelly is knitting Hooray For Me Gloves for her husband. She's knitting both at the same time and is up to the thumb gusset -- check them out here -- and now to the fingers -- more here. Kim "found confidence in the palm of a glove", successfully tackling her first knit glove! Kris plans to knit a pair of long, fingerless gloves inspired by a pair in a portrait. Margene plans to knit the "Merkje's Glove" from Nancy Bush's book, "Folk Knitting in Estonia". Regina's (scroll down) fingerless mitts are almost finished! Sharon is knitting a sparkling pair of "glittens". Springy is almost up to the thumb gusset of her fingerless gloves from "Weekend Knitting". Is it starting to get cold where you live? Thinking about knitting something warm for your hands? If so, it's not too late to join the Peaceful Palms Knit Along. If you're interested in knitting mittens, you may want to join Sandy's Warm Hands mitten knit along.